May’s Lick, Kentucky is simply May’s Lick, Kentucky. Or is it? May’s Lick is just south of the Ohio River. It is at that eastern edge of a state where many of the occupations appeared identical with those of its nearest neighboring state Ohio. The only difference was Kentucky had slavery, Ohio was against slavery. Depending on how you interpeted the geography of Drake’s residency, he was either just south of a state of freedom for the African-American population. On the other hand he was just far enough to the south of the Ohio River to be living on the other side of those bars separating freedom from the lack thereof. In terms of the medical geography of this region, similar very different conclusions could be drawn about Drake’s home setting. To the north was the well defined cold portions of the Northern Temperate Zone. Travel south and you head into the deepest parts of a much warmer temperate zone climate, which in some places approached the humidity, heat and discomforts of the couthmost torrid-like settings of this zone. On a bad summer’s night you might consider yourself too far into the south, and very susceptible to infection by the more vicious forms of fever striking these slave-rich states. As a result you may retreat into the cooler climates of nearby mountain settings, where poverty reigned along with diseases of a different form–due to fevers of a different form and geographical etiology. Daniel Drake was an industrious and well-learned doctor, but he at times seemed to go well beyond his boundaries trying to discover what was just on the other side of the unknown. 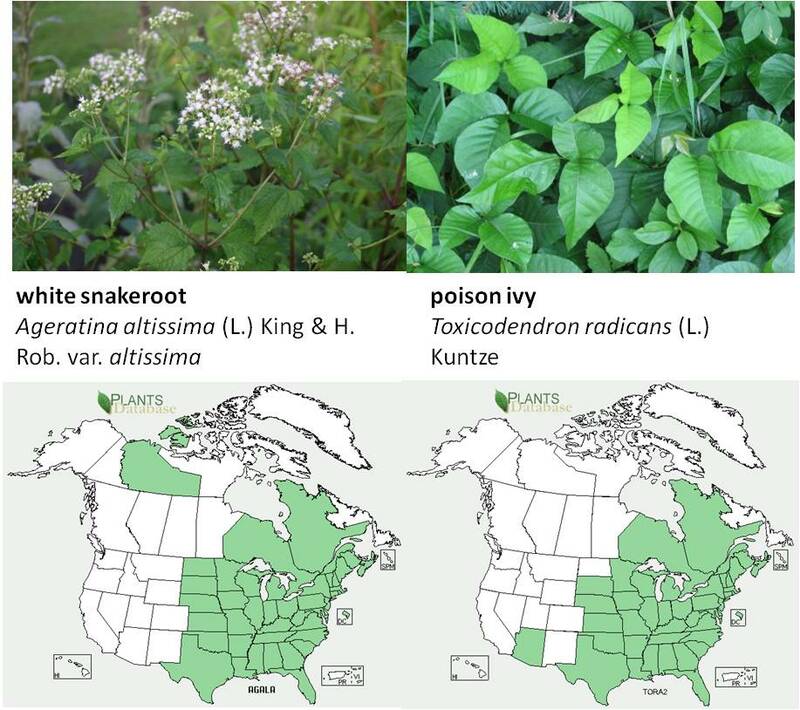 In the Midwest, as milk sickness began to strike numerous overland trail families, even killing some infants along the way due to the poison bore by the Europearium plant, Dr. Drake was busy contesting his theory that these deaths due to milk sickness were due to cattle and oxen grazing upon the numerous poison ivy plants residing in the same vicinity. One of Dr. Drake’s other very interesting writings (penned much later, ca. 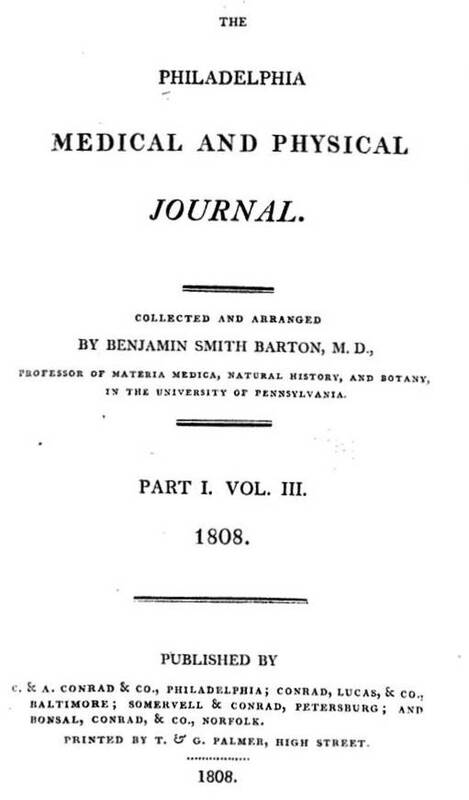 1845) was his geography of the Great Plains series, a massive three volume set that in part details the medical geography and geological findings for the time about how this part of the earth’s surface had formed. Drake’s summaries in these writings are at times informative, but not deserving perhaps of the lengthy amounts of text he produced building up to his final conclusions. Still, Drake’s writings and history are overall very informative and very important in the history of disease mapping and medical geography. When Daniel Drake wrote this article, decades prior to his milk fever mistake and his verbiose midwestern study, more than a decade had passed since yellow fever first drew the attention of physicians towards the geography of disease and the influences of climate and topography on disease behaviors along the east coast. The 1793 epidemic was the first yellow fever epidemic to strike this region since the colonial years. As a result, Benjamin Rush and others published a number of writings trying to define the cause for this serious and deadly epidemic. These first epidemics of yellow fever in United States port cities infected only a handful of these population rich settings. Philadelphia was impacted, as well as New York perhaps, although the effects of this fever would have been barely noticeable in comparison with Philadelphia. It is also possible that several other large port cities like Providence, R.I. and several more southern ports were infected by this new version of what was commonly refered to as malignant fever. With attention more focused by the time the second such epidemic struck Philadelphia, and this time most certainly New York City, physicians and others were ready and alert to the numerous potential causes out there for this severely bad example of fevers. 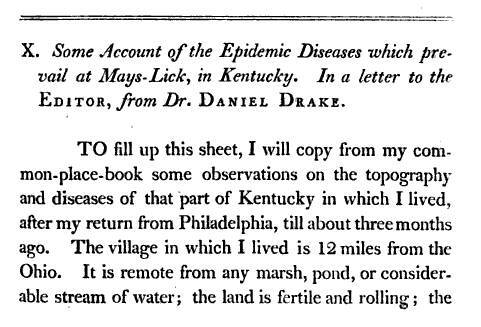 Like many writers, Daniel Drake mentioned a number of possible observations that he felt were related to the yellow fever that struck May’s Lick, Kentucky in 1807. He does not treat the inland epidemic in Kentucky as if it were the yellow fever epidemic. 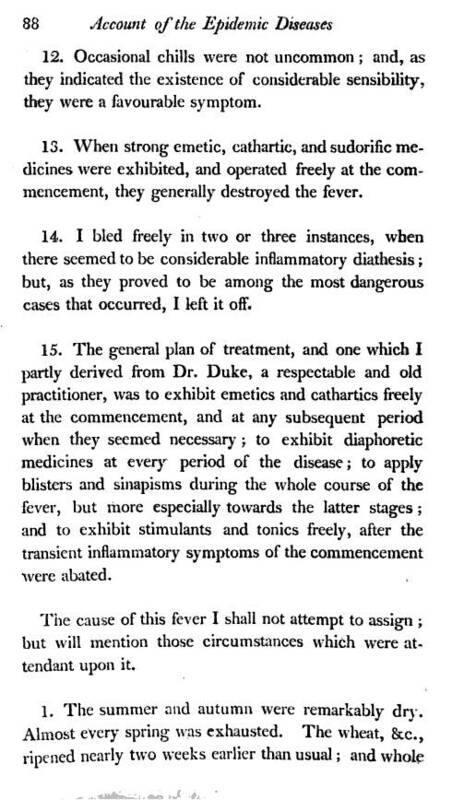 Were he familiar with the writings on Lake fever by Watkins of New York, then he most certainly could have included this “diagnosis” of the fever type in his essay. Fortunately and unfortunately, he does not. But as for cause and geographical reasons for this disease, Drake does take some cautious steps in drawing his conclusions. 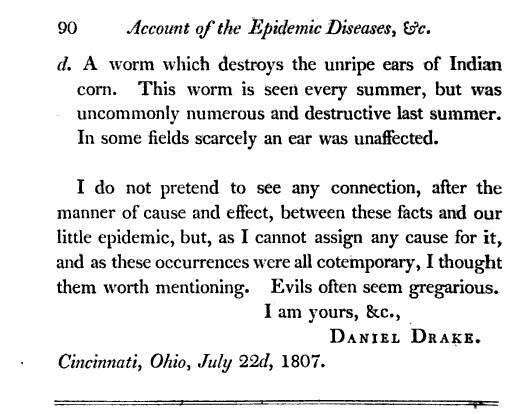 Drake rightfully includes the mention of insects as a possible cause for this mysterious and most deadly illness. In the mind of contemporary disease geographers for his time, he perhaps resided to far inland to be suceptible to the famous yellow fever with its roots in the Caribbean. 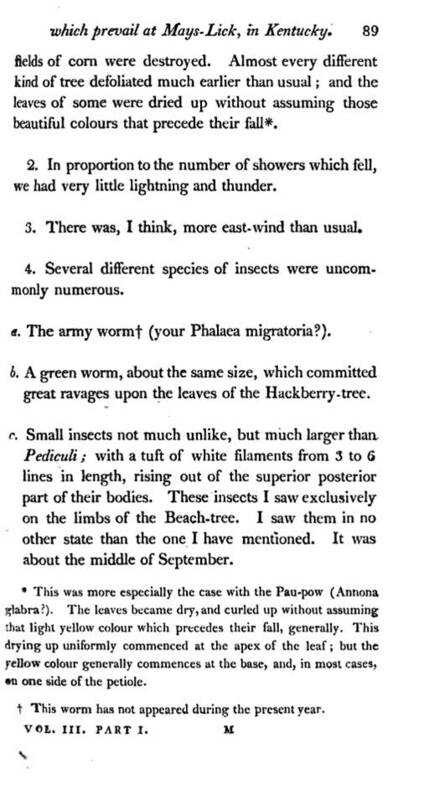 Much of the blame for this and other fevers like Watkins’ “Lake Fever” are related more to local topography that to just the local plants or insecta. But Drake added a few more possible causes for these typhoid and swamp fevers. 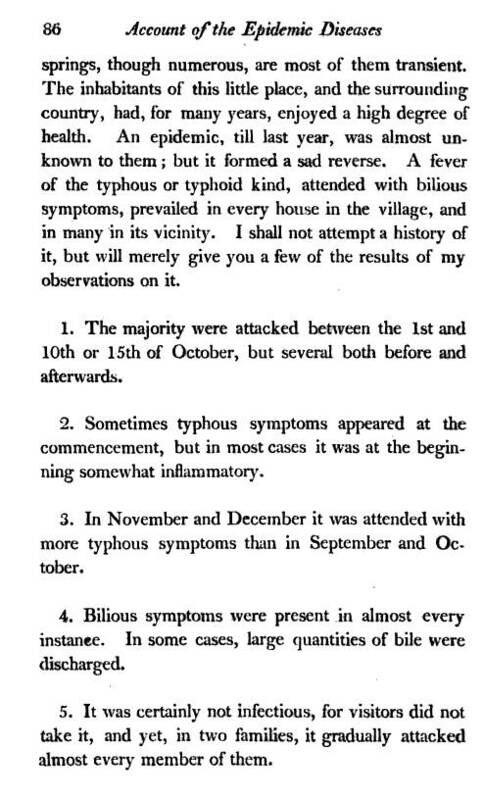 Daniel Drake writes about a form of “typhous” or “typhoid” fever with “bilious symptoms.” For the time, no distinction between typhoid (mosquitoes) and typhus (mice and rats) was known, and would not be even partially understood for decades to come. Drake notes the period when this fever struck as October “10th or 15th”. Could geography and the definition of disease zones on the earth be a reason for Drake’s conclusions and hesitancy to make an exact diagnosis? Were he living in Ohio, just a few minutes north of Kentucky in terms of latitude, then he might be residing in a state where yellow fever did prevail, due to the latitude in combination with the heavily travelled Ohio River. Moreover, this is the peak period for yellow fever epidemics to commence its continuous epidemic like pattern in places like Ohio. To the south it should have initiated two to four weeks earlier. But since this is still within the mid-Atlantic states region, this disease was considered to be now well into its period of time when it was expected to create havoc along shoreline and inland shipping routes. Such was not the case for Drake’s homestead setting, and so such was not the diagnosis for this May’s Lick Fever.